One of my fondest childhood sweet treat memories is chocolate fudge with crushed biscuits (if you grew up in South Africa like I did, you’ll know it as Marie Biscuit Fudge). It was one my favourite things to make and to eat and everybody would have it at their birthday parties. I don’t know why (perhaps because I have a little one due soon and already planning his birthday parties! ), but that chocolate fudge has been on my mind a lot lately. But now that I am a little older, and hope to think, a little bit wiser in the kitchen I wanted to make something that still honoured the memory but is a little more indulgent and grown-up. The original recipe only requires five ingredients, butter, icing sugar, cocoa, biscuits and an egg. I wanted to swap the cocoa for the real thing, so lots of melted dark chocolate and reduce the butter slightly. And an extra little variation was to add some caramel bits right at the end which meant little tiny swirls of caramel flavour spread throughout. It also has condensed milk instead of any sugar. 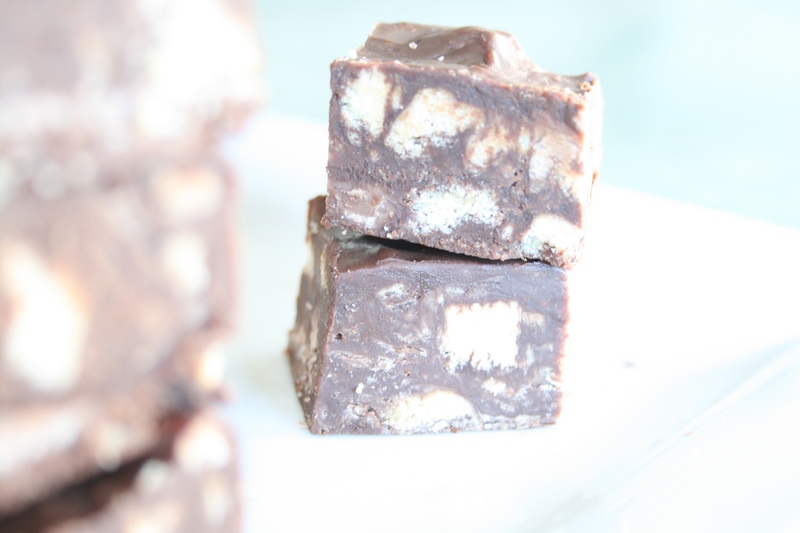 So the recipe below is a very soft fudge, almost like a chocolate truffle, but still has the magic crunch of biscuits and that wonderful chocolaty taste. It is also no-bake, so you just melt all the ingredients together and pour it into a pan and wait for it to cool. Dangerously easy. Place all the ingredients except the biscuits and caramel bits in a heavy based saucepan and melt together over medium heat, approximately 5 minutes. Be careful not to bring to a boil, once all the ingredients are melted together take off the heat straight away. Loosely stir in the caramel bits, just so that they are evenly distributed through the mixture but not completely incorporated. Pour into a prepared tin, squared or rectangular. 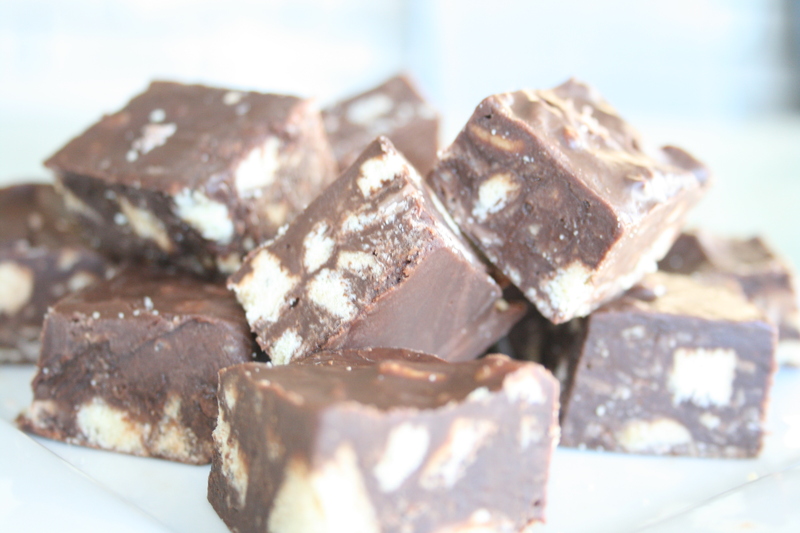 Place the fudge in the fridge to set for at least 3 hours (I had mine in the fridge overnight). Cut into squares and serve. The recipe will yield approximately 40 small squares.